What’s Next for the Sabres Hall of Fame? Dominik Hasek was the last person inducted into the Sabres Hall of Fame. That came in March of 2014, just a few months before his Hockey Hall of Fame induction and a little over two years since Dale Hawerchuk and Rick Jeanneret were inducted. In the five years since Hasek’s induction, the only major changes on the Sabres alumni landscape was the retirement of his number (one year later in January 2015) and the erection of Tim Horton’s statue in October of 2014. According to the Sabres Hall of Fame listing on the Alumni Association website (which does not yet include Hasek on the list of inductees), the current five-year induction hiatus matches the longest stretch the organization has gone through. They also went five years with no action between 1989 and 1994. The simple and obvious answer for the lack of activity is simply that there is a lack of deserving candidates to be nominated and inducted to the team’s Hall of Fame. The last thing the Sabres should do is dilute or cheapen the meaning of being inducted. With just about every deserving former player making up the 42-member list, there are very few obvious choices for expanding the current group. Pretty much any name that ranks in franchise record books has been accounted for in previous induction classes and those that haven’t garnered a nod are either still actively playing, coaching or broadcasting. Among the most obvious names that could be inducted whenever the Sabres saw fit are Lindy Ruff and Rob Ray. A lot of fans would balk at the notion, but I think Tom Golisano would deserve serious consideration and I would imagine the likes of Scotty Bowman and Floyd Smith would garner a fair bit of support as well. Other alums who probably have a decent case to be made in their favor – at least in terms of fan support – would include Mike Peca, JP Dumont, Miroslav Satan, Chris Drury and Daniel Briere. I’d venture a guess that there’d be grassroot support for Ted Nolan as well. Beyond that, the remaining group is made up of active players where Thomas Vanek, Ryan Miller and Jason Pominville will each have strong cases and certainly a few others. To have their names added once their respective careers come to an end. So, while there isn’t an abundance of obvious choices, the Sabres haven’t exhausted their potential nominees either. In the case of Ruff and Ray, it may just be a matter of waiting until Ruff decides to step down from the bench. Or perhaps it’s even easier and they just need to pin down a date when he’s in town as a visitor. I am curious to know why the team and Alumni Associate have taken an extended hiatus from making new inductions to the Hall of Fame. Or why they haven’t taken additional steps to honor certain aspects of the franchise’s history. I feel that the Sabres have developed a somewhat uneven relationship with their history in recent years, especially during the Pegula’s tenure as owners. For every impressive gesture, such as inviting every living former Sabre to April 8, 2011 game against the Flyers, they have an equally questionable ones, removing the historic timeline near the Blue Zone Bar or Dominik Hasek’s understated jersey retirement comes to mind. The one thing I’ve wanted to see more of from the Sabres is to embrace their nearly 50 years of history. There are tremendous moments, players and traditions that should be built upon but I don’t think nearly enough is done on a regular basis to highlight it. Taking such a long break from inducting anyone to the team’s Hall of Fame encapsulates that quite well. I’m not advocating that the Sabres have a mandatory Hall of Fame induction on a year-to-year basis. Bucking history and opening the doors to any player who elicits a twinkle in a fan’s eye would be foolhardy. But it seems convenient to have taken a break smack in the middle of the rebuilding effort. Perhaps the franchise is planning something big and that’s part of the reason they’ve gone as long without a Sabres Hall of Fame induction. Maybe they have plans to introduce in-arena features once they finally begin renovations. I’ve previously lobbied for a proper Hall of Fame to be built-in the space behind the Sabres Store along Main Street. Something which could include historic memorabilia, interactive displays which would be a draw for fans on game days or even in the offseason. If that was the long-term plan for the Sabres Hall of Fame and why the team has held off on making additions, I’d be ecstatic. While on that subject, I think it would be excellent to expand the Hall of Fame honorees into the arena interior. The display in the Sabres hallway is beautiful and very well done, but only a few fans get to see it. So, it’s not exclusive to the players, nor is it on display for every fan to see. 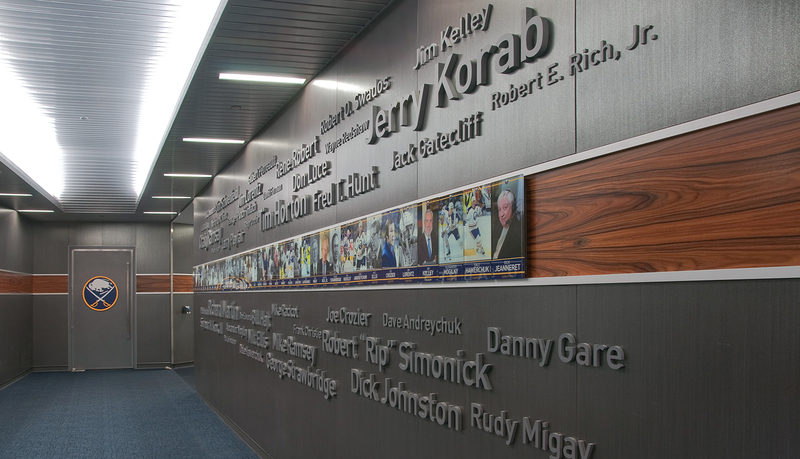 Why not take advantage of the large walls in the 300 level and add a tasteful Hall of Fame feature around the upper ring of the building? One other thing which I think they could shoehorn into this is honoring previous teams and accomplishments. Short of inducting an entire team into the Hall of Fame, a night looking back on the 2005-06 season or 1998-99 along with a cool, interactive area on various teams in franchise history throughout the concourses that would allow fans to get a cool history lesson would be a terrific addition to the typical Hall of Fame/Wall of Fame practice. Ultimately I want to see the Sabres take every possible opportunity to build and share their history with the fanbase. If no new inductions are announced, the Hall of Fame will be on a six-year hiatus at this time next year. That seems like a good place to start. I would love to see Rob Ray inducted as soon as possible so they can get rid of him at the end of the season. Every game, I get annoyed listening to him.